I have known Moises Naim for many years, and admired his pragmatic approach to managing the content of Foreign Policy, as published under the auspices of the Canegie Endowment for International Peace. He has been Minister of Trade and Industry in Venezuela, a dean and professor of business administration, executive director of the World Bank, and an accomplished thinker and author. Above all he has been moral. He gets it: morality in politics and morality in business are priceless. 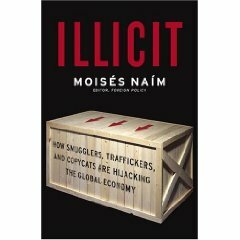 This book is important in two very big ways: the first, the one that most are noticing, is that it documents very ably the fact that crime pays–the author has done a superb job of itemizing the global illegal trade industry in a manner that could be understood by anyone, and the bottom line is frightening in that illicit trade is perhaps $2 trillion a year, while legal trade is between $5 trillion and $10 trillion. Off-the-books bartering and immoral invoicing within corporations are additional reducers of government tax revenue–import export tax fraud in the USA is known to be $50 billion a year ($25 rocket engines going out, $10 pencils coming in). The second reason this book is important, the real value of this book, is in documenting the revenues lost to government. Legalizing prostitition has economic as well as public health implications. Reducing the arms trade, where the US is the greatest exporter of violence and bribery, has implications across ethnic conflict, stability, water and oil conservations, and so on. Eliminating counterfeiting and illegal immigration would have enormous implications for positive constructive government revenue. I personally know where $500 billion a year can be found in additional tax revenue for the US, mostly from eliminating pork barrel subsidies and corporate fraud, and by restoring the traditional share of corporations to the tax fund–when Halliburn pays $15M on billions in profit, when Exxon makes $3 billion in profit in a single quarter with no requisite tax bite, the system is broken. Eliminating crime, and corporate crime, provides the financial foundation for restoring the democratic contract, the social contract, with the working class and the middle class. Moises Naim has, in brief, delivered the seminal work on one of the five factors that will determine how the human species does in its World War with itself and with bacteria. The other four factors are the end of cheap oil, the end of free water, the virulent re-emergence of infectuous diseases accompanied by the mutation and migration of new diseases from animal hosts to humans; and the promising but by no means assured emergence of collective democratic intelligence, perhaps aided by real-life decision support games such as those produced by BreakAwayLtd.com. I consider Dr. Naim to be one of the most precious intellects now active–as penetrating but more pragmatic than Joe Nye, as strategic but more pragmatic as Zbigniew Brzezinski, as articulate but more pragmatic than my all time favorite strategist, Dr. Colin Gray from the United Kingdom. Naim is a giant. He also represents, if I may be permitted an observation from my decades in Latin America and my Colombian-born mother, why Latin America is the future and why the US ignores the Chinese takeover of Latin American lands and resources, the Iranian penetrations, and the related Brazilian, Indian, Pakistani, and Russian incursions, at its peril. Latin America is both the source, and the solution, for most of the illicit trade that undermines the Republic. It’s time we recognize that morality matters, crime is a greater threat than isolated terrorism, and Latin America is part of the Americas–the part that may achieve informed populist democracy before the USA recovers from the neo-conservative coup d’etat and ethical misadventures of a White House owned by Halliburton and dismissive of both the domestic and international publics.